Mold your pipecleaner into a rainbow shape and twist them together at the ends. 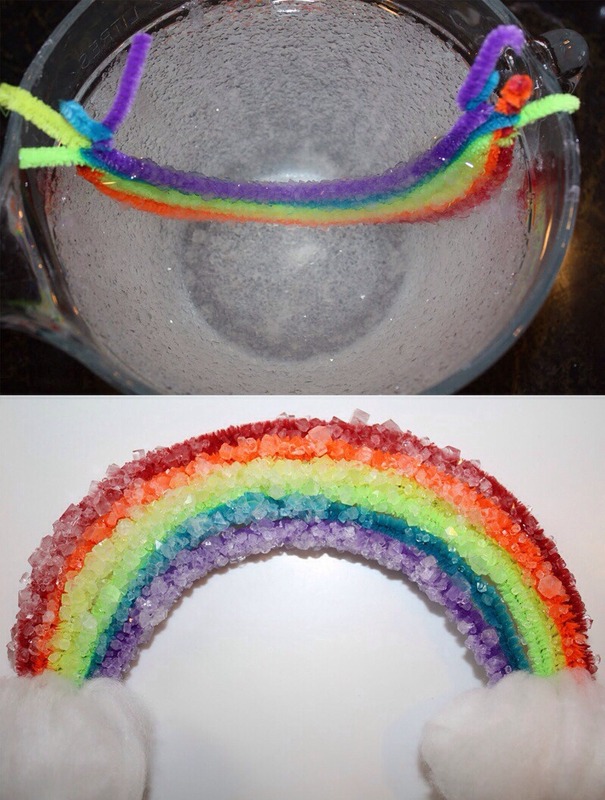 A 8 cup batter bowl was used and use the ends of the pipecleaners as hooks to hold the rainbow upside down in the solution. To make the solution, use 2 full scoops (with scoop provided) of borax and boil the 8 cups of water, pour it into your bowl and attach your rainbow, make sure the sides aren't touching, leave it sit for 24 hours. Large cottonballs were used to cover the twisted ends of the pipecleaners. How cute!! Note: while borax is a natural product, it is not intended to be consumed or inhaled so be careful and follow the procedure on the box.